This boils down one of the first lessons of user-centered design, a process that helps ensure that new products are built for real users’ needs. Users live in the real world. As people with lives, they use smart phones, other applications, and other websites. They have come to expect instantaneous information, intuitiveness, simplicity, even beauty. Today’s applications must meet high standards or pay a price. Users are not monolithic. They do not all behave in the same way; they have different roles, backgrounds, and needs that must be accounted for. Users are not Spock. They do not always think and act “logically.” They do not always read everything. Designs need to account for short attention spans, mistakes, and unexpected behaviors. The Folio team is utilizing the very latest techniques and practices to put real people—capital planners, project managers, and program managers—at the center of our design work, and to keep them there for the duration of Folio development. 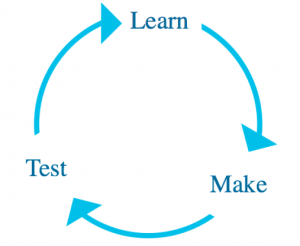 The foundation of the user-centered design (UCD) process is a cycle that we’ll summarize as: Learn, Make, Test. This cycle repeats itself throughout the design and development process, and particularly fits into the Agile development process. Here is how the UCD process has played out with Folio. User research is vital to a successful design project. To learn about our users we’ve employed surveys, interviews, card sorting, contextual observation, and design studios. In addition, in January 2017, we hosted a set of visioning sessions. 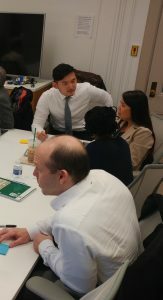 For these, eCPIC administrators and capital planning leaders from 15 agencies came together to answer questions like these: Who is the new application for? What do they need? What will differentiate it from other tools? The sessions yielded a collective vision statement to set us on a path forward. 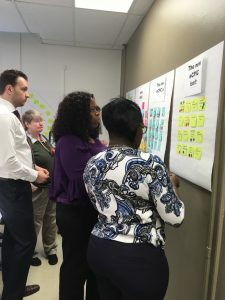 The results of the sessions were distributed back to the agencies, and they continue to provide consistent direction for the design and development teams. In May 2017, we began hosting regular “tiger team” sessions. Tiger teams take a deep dive into a particular area of functionality, such as life cycle costs or user access. Through group sketching, presentations, or discussion, participants identify user needs and possible solutions. Armed with ideas from our users, the design team develops wireframes. Wireframes are like blueprints of actual webpages, capturing the intended functionality and layout without the “interior design” elements of color and style. Wireframes capture what content will live on various pages, what actions can be taken, and how a user will navigate from one place to another. They can be created very quickly because they are not built in code or tied to any database. They can simulate the feeling of working in the applicat ion without the complexity and expense of programming. 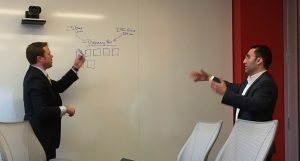 Wireframes are shared with developers to take technical considerations into account, and are also shared back with tiger team members for input. Once the wireframes are ready, we test them with real users (aka people). 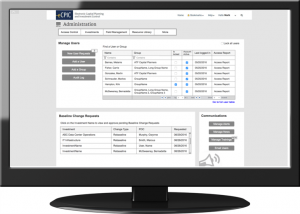 For Folio, we make sure to test with a range of users, including project managers, program managers, capital planners, and administrators. Usability testing involves sharing the interactive wireframes with participants, and asking them to complete simple tasks, like creating a new activity. We always remind participants that usability testing is not a test of their skills or knowledge; it is a test of the designs. If the person has trouble completing a task, it is on us to revisit the screen’s assumptions, icons, language, flow, layout, etc. Do we always change what a participant tells us to change? No. But if enough people have trouble, we know we have to make a fix. What goes well in testing we keep; what goes wrong, we revisit. We ask more questions (learn), iterate on the design (make), and assess (test) the wireframes again. Once we feel our wireframes are working for people, they are entered into the product backlog to be prioritized by the product owner. This process gives the team confidence that we are building an application that is both useful (meets real users’ needs) and usable (intuitive). Down the road, we’ll also conduct testing using a real working prototype to gain additional user feedback. The user-centered design process helps reduce development time, redesign costs, user training needs, user errors, and user support costs. We invite anyone in the eCPIC community to get involved in tiger teams and usability testing. Please contact FOLIO.PMO@gsa.gov for more information.